You’ve felt it yourself- the undeniable boost to your mood and spirit you feel when you’re with your pet. Every year, thousands of Pet Partners volunteer handlers around the world share this gift by bringing joy and improved outcomes to millions of people. You’re here because you share our vision, and want to improve lives in your community. We’re here to get you started and support you along the way. One of the best things about Pet Partners is while dogs make up 94% of the teams in our Therapy Animal Program, we also welcome friendly, well-behaved cats, horses, birds, pigs, llamas & alpacas, rabbits, rats, and guinea pigs! To become a volunteer therapy animal team with Pet Partners and begin visiting, you and your pet will first need to complete our registration process. We use this process to be sure your pet is healthy and well-behaved, and that you have the right training too. What are the benefits if I register with Pet Partners? I think I’m ready to get started. 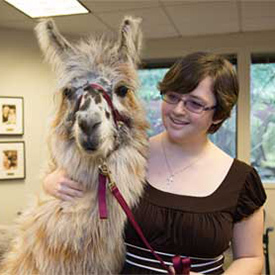 Is the Therapy Animal Program a good fit for me? Before getting started, it’s very important for you to take a look at the following resources to help you decide if the program will be a good fit for you and your pet. Take our quiz to find out if you and your pet are ready to form a therapy team. Thoroughly review Pet Partners’ Program Requirements and Policies and Procedures. Find out if the program is established in your area. Run a zip code search and consult our calendar of events. Many of our volunteers also find it very helpful to first attend a Volunteering with Your Pet webinar to learn more from a current volunteer. I’m definitely ready to get started. What’s next? Create your online account in the Volunteer Center – you’ll need the account for each step of your registration. Once you’ve completed your registration, you’ll log in to find additional resources, tools, and support. The key to safe, effective visits is the training for the “human end of the leash”– you. The Handler Course is not an animal training course. Instead, you will learn your responsibilities and expectations for successfully volunteering as a Pet Partners handler in any facility you wish to visit. The course can be taken either in-person, if a volunteer instructor lives in your area, or online. The in-person course is a great opportunity to ask questions of an experienced Pet Partners volunteer and make connections in your local community. However, there may not always be a course in your area at a time that works in your schedule, so the online course is a great alternative. You must complete and pass either the online or in-person Handler Course before attending your team evaluation. Our Animal Health Screening Form will be signed by your veterinarian, confirming that your animal is healthy and able to participate in the program. The form is available as part of your online registration process. Only the Pet Partners’ official Animal Health Screening Form is acceptable documentation to meet this requirement. This is the moment of truth when you and your pet demonstrate that together you are able to conduct safe and effective visits. The team evaluation is a mock therapy animal visit conducted by a Pet Partners volunteer team evaluator. Remember, you must complete and pass your Handler Course before the date of your team evaluation. Lastly, read, review, and accept the terms of the Volunteer Agreement; opt in to our special Read with Me™ and Walk with Me™ initiatives if you like; and upload a photo of yourself and your animal that will appear on your therapy animal team ID badge.